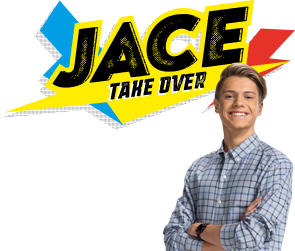 Get ready to meet the kid behind Henry Danger, Jace Norman! We've got tons of fun facts to help you get to know Nick's newest star. Remember that, 'cause Jace expects presents AND cake! (Just kidding). You know what they say. Only the best come from the Southwest! He has an older brother and sister. That's right, Jace is the youngest in the family! Jace has had a bunch of awesome pets in his life, including goats AND even a pig... but right now he'd really like a dog. It didn't take long for Jace to start making moves, literally. He moved to San Diego, California when he was just 8 years old. He loves playing soccer, water polo and basketball. Now he's adding crime fighting to the list! This one is obvious, but Jace started acting when he was only 12. And he hasn't stopped since! Jace loves riding his bike around town, making him pretty much the coolest thing on two wheels. But you already knew that, right? If you didn't, wait and see just how funny he is on Henry Danger!